There's a lot of story to tell, too much to try to share tonight. 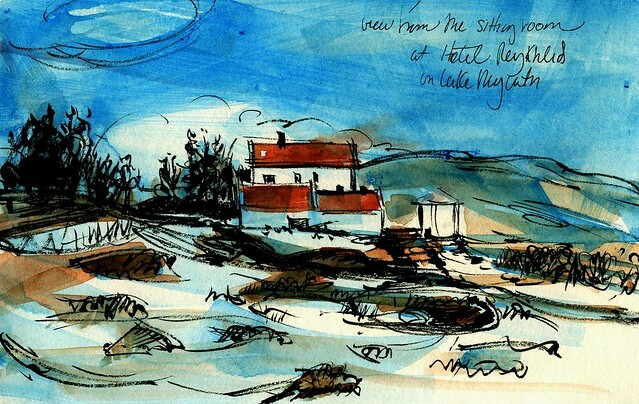 But before I post a few sketches, I will share quickly some memories: my exhilarating polar swim in the Irish Sea on New Year's Day; seeing the Quadrantid Meteor showers on my birthday night while wrapped in many layers and sitting on the front lawn of our cottage on Whitesands Bay; with the help of a traveling professional astronomer on the same birthday night, seeing nebulae, a galaxy, the Milky Way in bright form, many constellations, the fuzzy green comet 46P/Wirtanen; at Evensong of the first Sunday of Christmas at St Davids Cathedral sitting in the choir stalls with choir and clergy, hearing hymns and the liturgy in both Welsh and English. I walked and walked and walked and walked some more until my heart was overspilling. My husband and I slept deeply in that quiet, safe, numinous place. It's been another rough re-entry to real life (like the one from Norway last year) but I have several paintings going, a few from before the trip, but several newly started ones, all inspired by Wales. This circular and multi-pronged approach has me nudging each one along until I finish one, then another, then two more, etc. I'm happy in the studio. So, sketches, just a few. I spent more time being, being outside, walking, resting, being with my husband, taking it all in. Looking out over the Irish Sea to Ramsey Island and beyond, from the warmth of our cottage by the sea. This is white marker and pencil on brown paper. 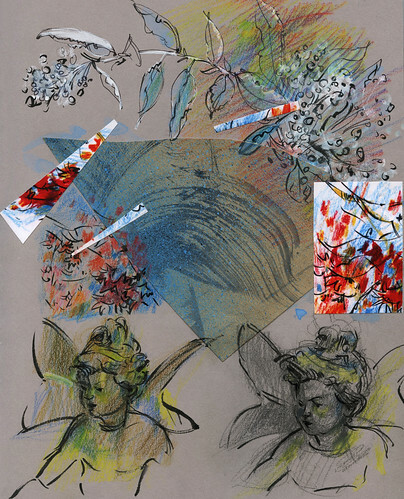 In real life, the sketch goes across the gutter of the sketchbook, making a double spread. I will add the other side later. 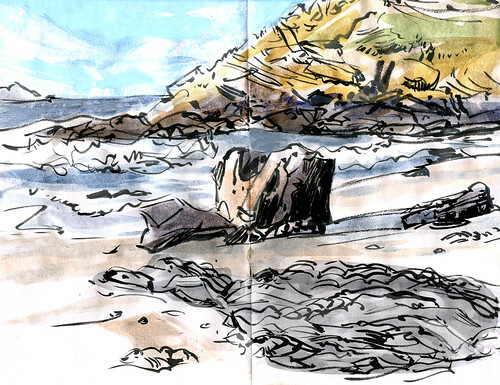 Brush pen sketch made on site at Whitesands Bay, color added later. These rocks and the ones below are old friends. 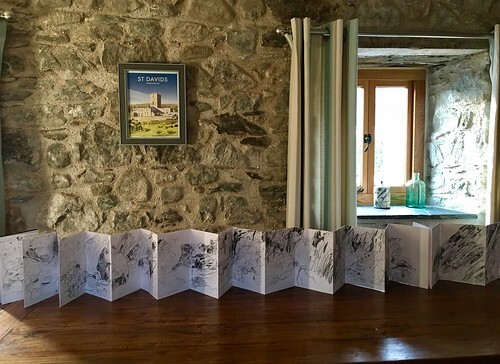 They figured in the 12' long concertina sketchbook I made in May 2017, part of my Caledonian Orogeny project! The first thing I bought on New Year's Eve day were two votive candles and holders. 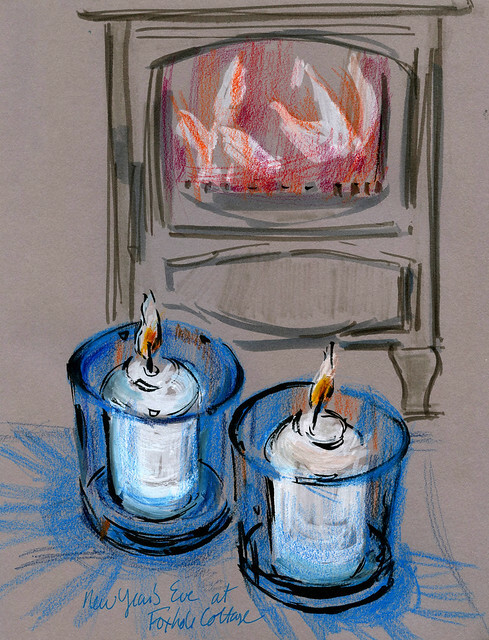 With these and the wood fire burning in our cottage living room, we had light and warmth. After the polar swim on New Year's Day, I was cold and starving, so David and I repaired to our favorite St Davids café at Oriel y Parc and had lunch. 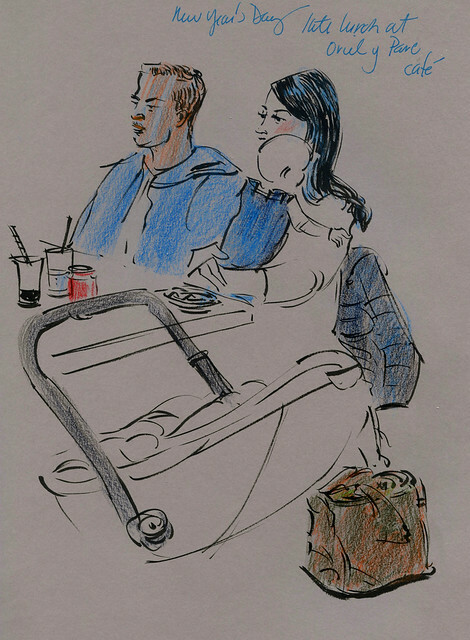 I drew the family at the next table. 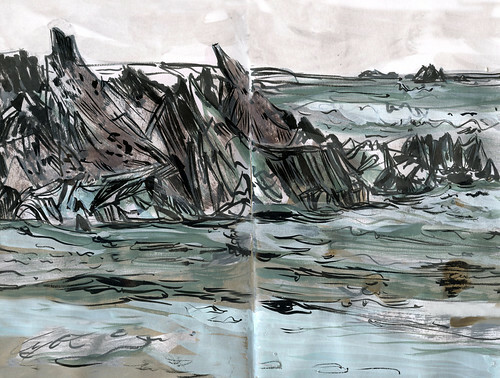 Sketch of St Davids Head, made standing on Whitesands Beach in the cold and wind. This and the one above are roughly and quickly drawn (the cold! the wind! ), with color added later. I'll be staying at home more this year, finishing paintings, being with family and friends, walking and trying to get more sleep! Wales spoiled me in that way and in so many others. A tardy, but very Happy New Year's greeting to you! Summer heat has cast a pernicious spell on me, it's clear, but the winds are changing, the light is changing, and, finally unwilting, so am I. Weather aside, reentry to normal life has been very difficult after such an exalted and inspiring time in Norway. My chief reason for going on this trip was in pursuit of my Places Project, to see and draw another vestige from the Caledonian Orogeny, circa 450-250 MYA. 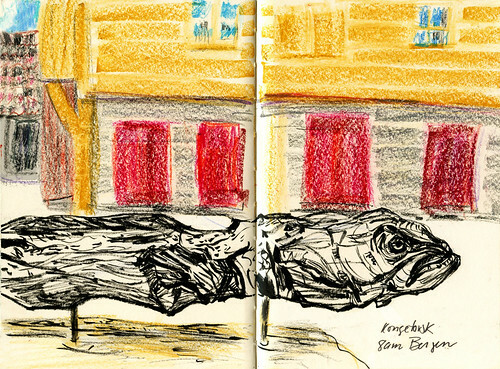 I had fewer days to do this than I had for my first two drawings, made in Wales, one in Pembrokeshire, one on Anglesey. The accordion sketchbook I drew in here was custom made for me by book artist friend Josh Hockensmith. 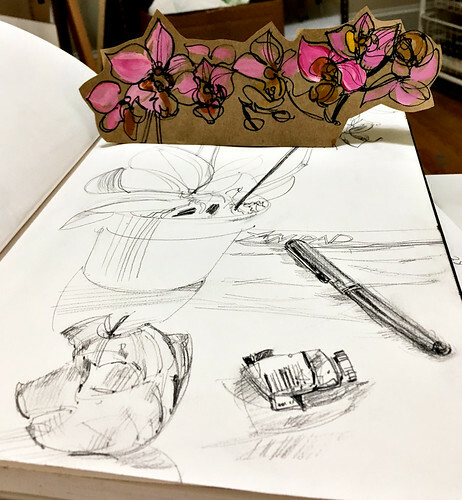 It is 10 1/2' long when stretched to its full length and each page is bigger than those in the Seawhite of Brighton concertina books I used in my first two drawings. 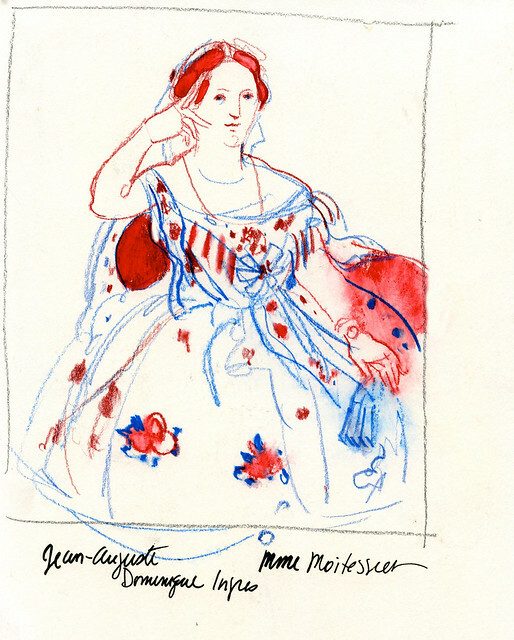 The paper is ivory and slightly toothed, not white and smooth, and so the resulting drawing has a slightly different look from the first two. The rocks I drew were very different, too. The rocks in Wales were faceted, sharp, angular, with mostly smooth surfaces. 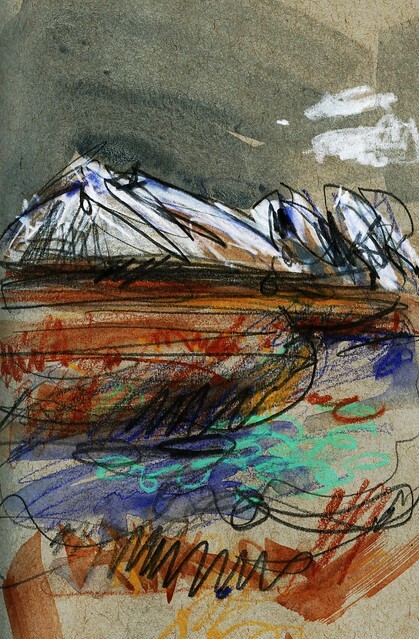 The rocks in Norway were flowing, textured, and multi-colored in shades of grays, ochres, some siennas and subtle blues. These outcrops will lend themselves to later studio pieces, some collages, some linocuts, perhaps, and I am looking forward to seeing what will emerge! 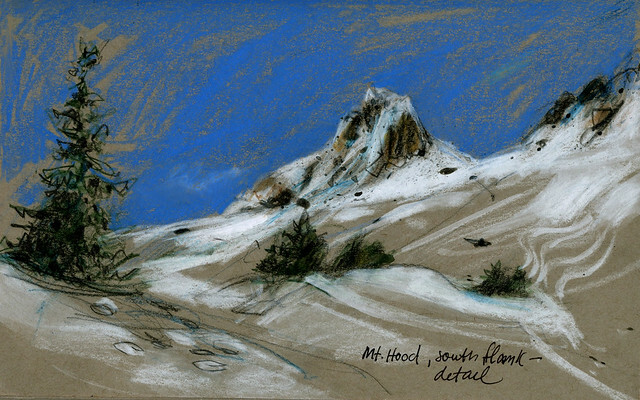 In between my days of Caledonian Orogeny drawing, I sketched, as you will have seen in my last post. 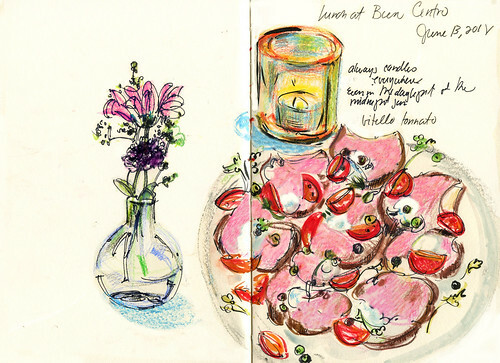 Here are some miscellaneous moments, caught in my sketchbook. 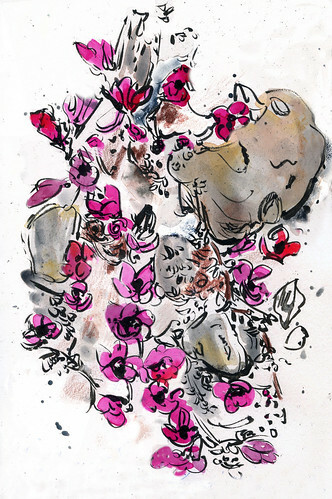 On a remote island in the Barents Sea, magenta saxifrage grew improbably and brashly between rocks in the tundra. 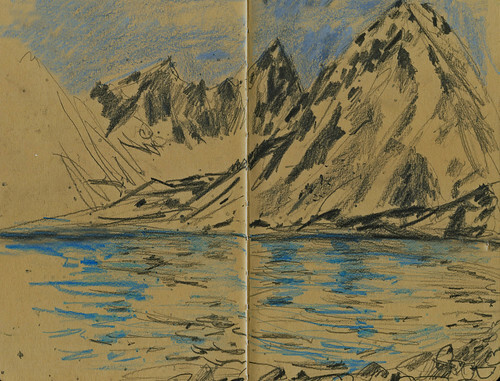 Later, in the Lofotens, I drew another view of the majestic Olstind mountain, seen from our cabin near Reine. My husband and I love Bergen and it was in Bergen that I had this delicious vitello tonnato dish for lunch at a café near the Kode Museums. Note the candle, lit in the middle of the day in sunny, summery Bergen. 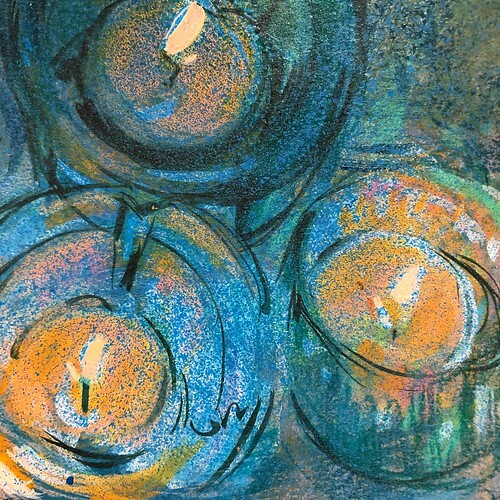 This is one of the things I love about Scandinavia, the use of candles, a profound celebration of light, at all times of the year, at all times of the day, in the Polar Night or in the time of the Midnight Sun. I have taken this to my heart and I do the same thing in our home in North Carolina. The second is an example of What I Did for Love, a snowy owl painting requested by my four-year-old grandson Miles. I have two more requested owlish pieces to finish, but I am returning to Norway in the studio in the next days, too. I won't wait so long to post again. Soon I am taking a shortish trip with two dear friends to Yorkshire, not on the trail of the Caledonian Orogeny. The main focus will be to spend time with my friends in the birthplace and childhood region of one of them. Though I have lived and traveled widely in the UK, I have never been to Yorkshire. It turns out that my long-ago ancestors from Norway, settled in Yorkshire (coincidentally near where we will be), before much later emigrating to the US, so I will be, in some small way, returning home. Who knew??? See you soon! Well, those were three glorious weeks! My Inner Adventurer emerged big time, much to my delight! i'm still crowing with pleasure and pride over kayaking in polar waters! We went just beyond the 80th parallel, as I mentioned we would and it was all that I had dreamed of! It was celestial. It was never to be forgotten. More later about all of that. For now, a scattering of sketches, quiet glimpses of things we saw and did when we weren't being swept away by magnificence. A large carved wooden sculpture called Kongetorsk, (cod is one of the traditional mainstays of Norwegian cuisine, commerce, and culture) located in a small square in Bergen, is a favorite subject of mine. 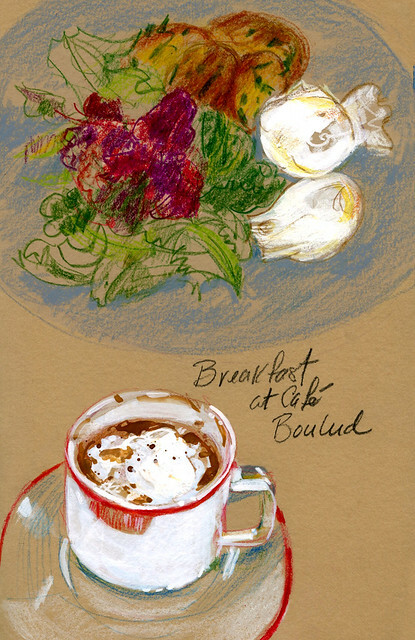 David and I woke up early so I could draw it before clumps of view-obscuring tourists arrived. I had *drawn this one December a few years ago, so it was fun to revisit and draw it again! See below for earlier drawing. 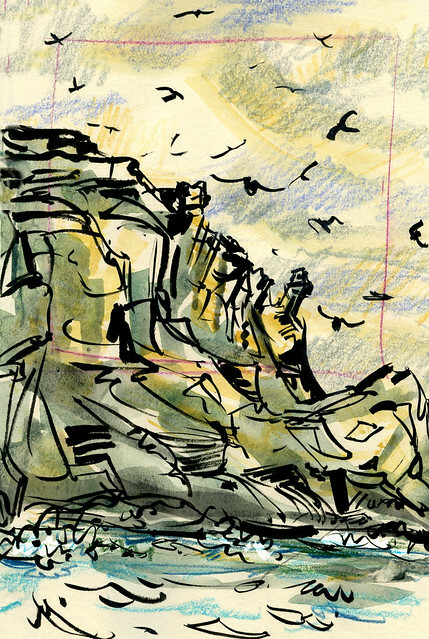 Oh, man, trying to capture the splendor of that scenery in a little sketchbook seemed futile, but I made what I call little mnemonic devices... images that endlessly reopen to me the moments of being there. We visited a toy museum at the tiny village we stayed in near Reine, in the Lofoten Islands. 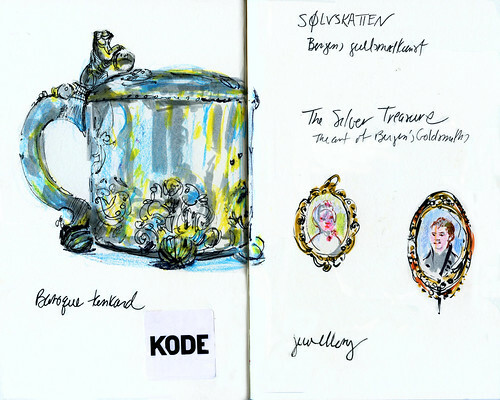 I made friends with Dagmar Gylseth, the owner of Sakrisøy rorbuer (fishing cabins and cottages) there and drew this little scene from her marvelous museum. What a moving experience to be surrounded by her collection of hundreds of artifacts of Norwegian childhood. Their stories and their meaning were palpable in the atmosphere there. While in the Lofotens, David and I had our evening meals at Underhuset, the fabulous restaurant which is owned and run by Dagmar and her son Michael. Fresh seafood was offered in abundance! In fact, I ate seafood and fish three times a day most days throughout the trip. I expect gills, fins, and shells to sprout on my person at any moment! And I'll put my current Omega 3 count up against yours any day! 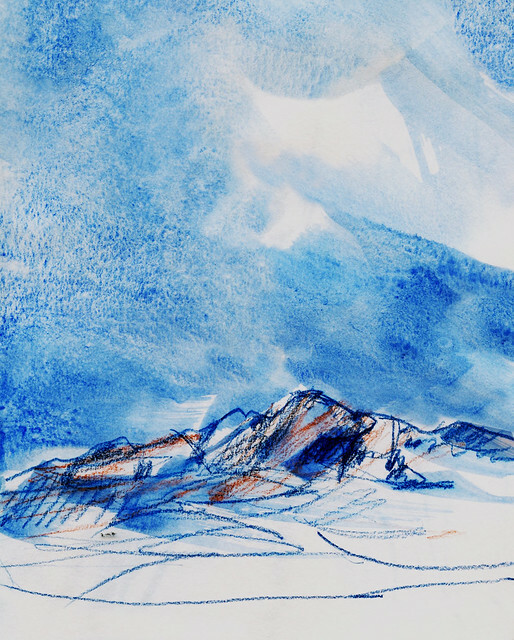 We went to a lecture on the geology of Svalbard given by a French geologist on board our ship and while I listened, I drew. Geology! Svalbard! Caledonian Orogeny! All my favorite subjects! 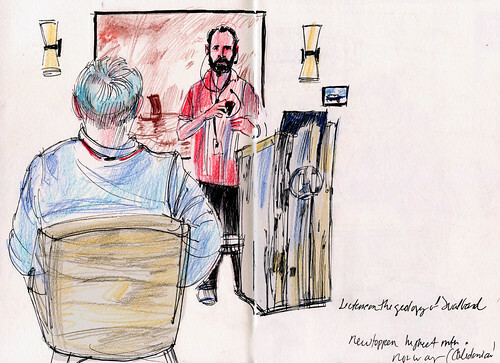 Rounding out this miscellany of moments on our Norwegian trip is a sketch I made in Bergen, at one of the city's art museums, during the last days of our visit. Shiny, compelling objects that here, too, arrested my eye and my imagination. 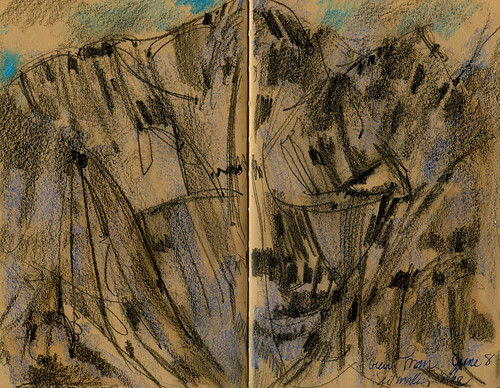 I have several more sketches as well as the accordion sketchbook I made of Caledonian Orogenic outcrops and will share those in the next days. I have begun some studio pieces as well, deriving from the images I lived and breathed and stored in my mind's eye. 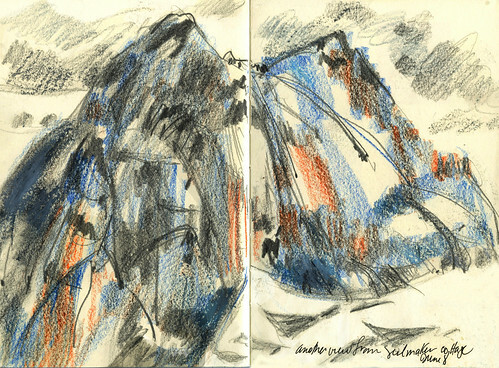 Balancing my accordion sketchbook... Laura on the rocks! More to come! Come back soon!! 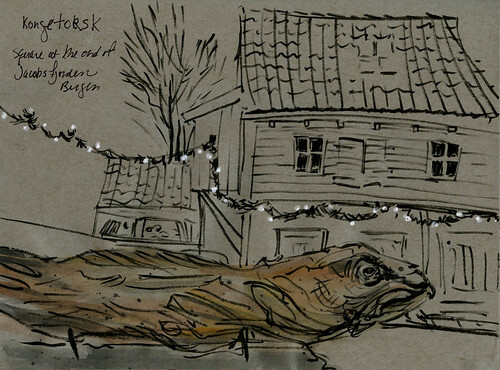 *Here's the same cod sculpture pictured above, but drawn on an earlier, winter trip. That's where we'll be the first part our trip! Far, far, far northern Norway, off the mainland. I am going to try to get some sort of memento with that latitude engraved on it! I'm a north-going spirit, that's for sure. 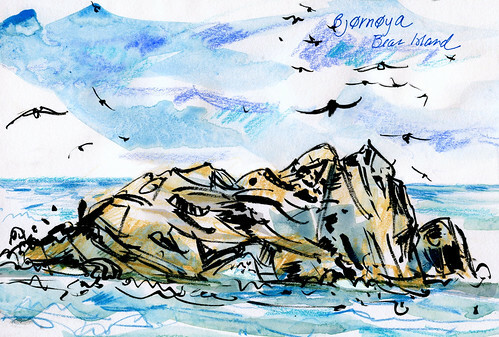 This being such a once-in-a-lifetime trip, I vow to document it fully in writing and sketches, in addition to the separate group of drawings I'll do for my Caledonian Orogeny project. But what supplies to take with me?? I travel only with a carryon and that has to contain clothes for winter weather (still there in May and early June in Svalbard) as well as for cool spring days, which I hope we will find in the other parts of Norway we are going to. Yikes! Wakeful at 2am today (and you can understand why! ), I looked at past sketches of similar atmospheric situations. Here are my tentative choices. If you have any suggestions, by the way, please do make them! More Iceland. 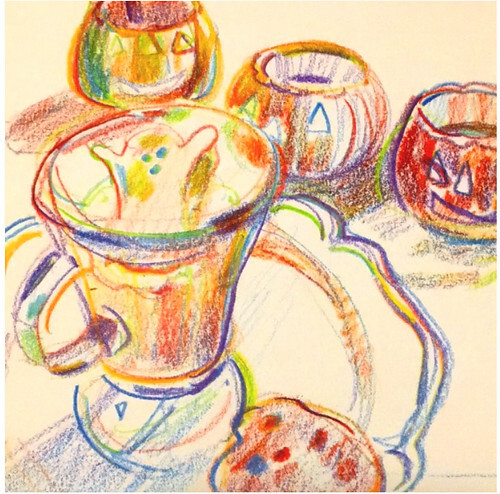 Here there's a wash of Daniel Smith Lunar Black with the crayons. I'll take that and Lunar Blue and those will be my only watercolors. Right? I can add more washes later. if I want to. Mt Hood, Oregon. Unlike my previous trips to Norway, which all took place in the Arctic Twilight, this trip will be, as I mentioned, under the Midnight Sun! 2. Pentel pocket brush pen. These are practically extensions of my hands. I use them everywhere. 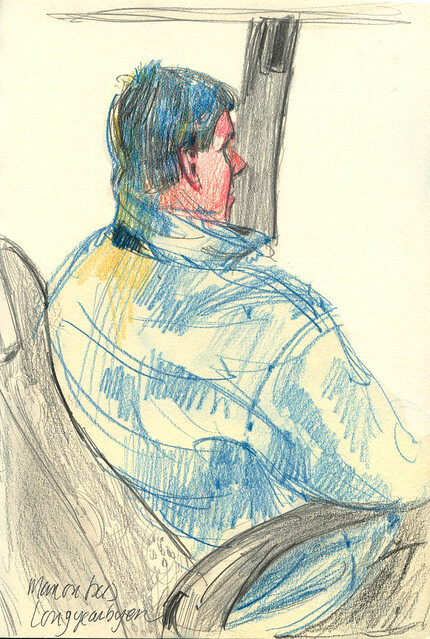 In E.Lansing, Michigan, with watercolor crayons! Two for the price of one! 3. Inktense pencils? When you must have bursts of juicy color! 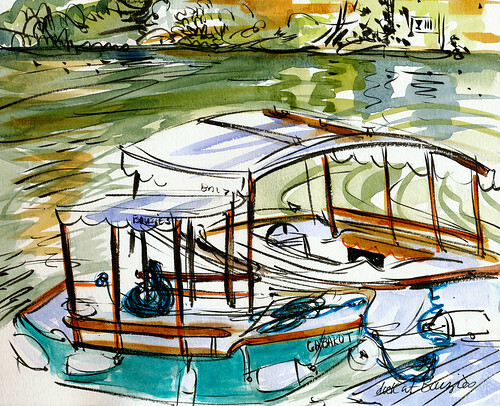 Don't you love how a mere spritz of water makes inktense sketches ebullient! 5. Sketchbooks: I'll have a couple of custom handmade concertina sketchbooks for the rock drawings and then two Stillman & Birn softcover 8 x10s, one in gray, one in white. 6. 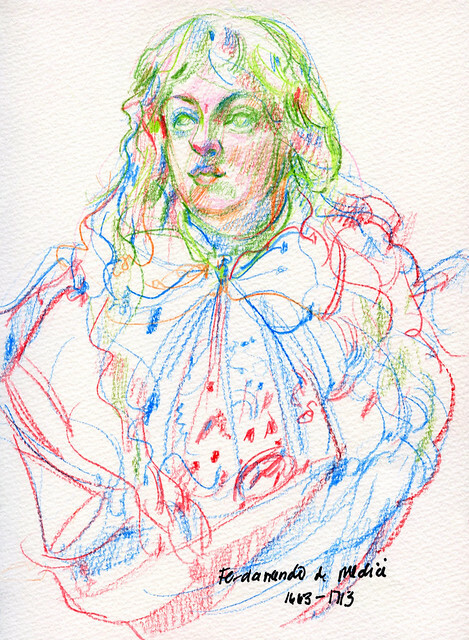 Blue and red colored pencils, not watercolor ones. Oh, let's add orange and green, too. I just like to draw with these and they come in handy if you want quick, dry color. Oh, I've given myself a headache now. 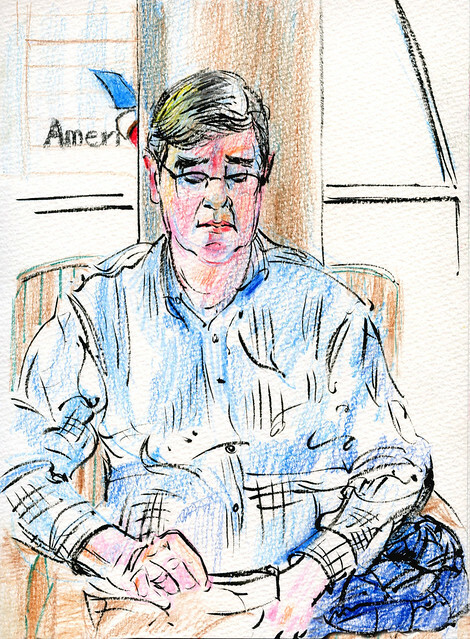 I'm serious... if you have any suggestions, any new products you like for travel sketches, or old favorites of yours (not watercolors, though, or fountain pens for this trip, unfortunately,) I'd love to have them! I've been in a long new moon phase, hidden from sight, but very here. Just recently I've begun to see the 15 or so (!) paintings I've been making start to gel a bit. Of these, how many will eventually be finished, I have no idea. The ones that need to be finished will make themselves known and I will just keep at it until I know which they are. This process is very slow but it appears to be mine for now, so I accept it. Deadlines and rushing can come later. 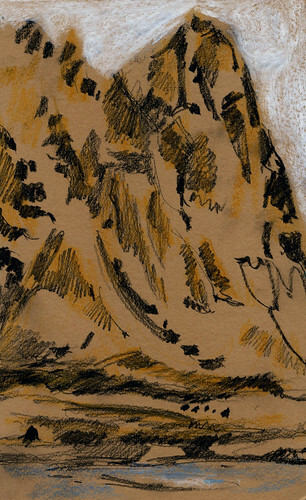 Here's a detail of one of these in progress. This is one of what I call 'portal paintings,' small at 12" x12", but big enough for me to squeeze through to the next incarnation. 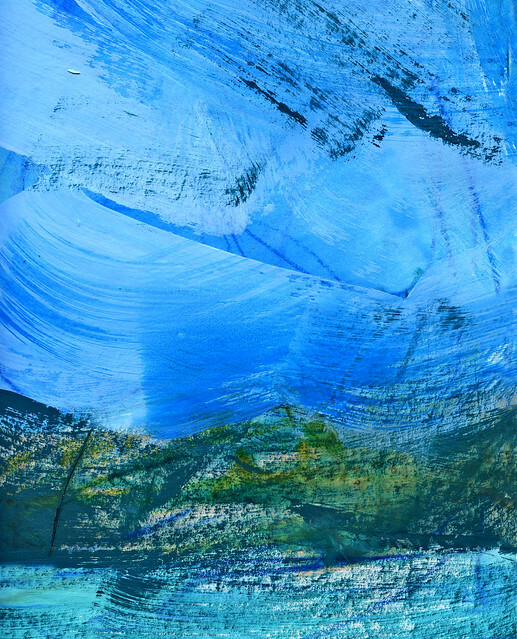 All of the pieces I'm working on are inspired by my numinous places, this one in particular is inspired by a bay in northern Wales. 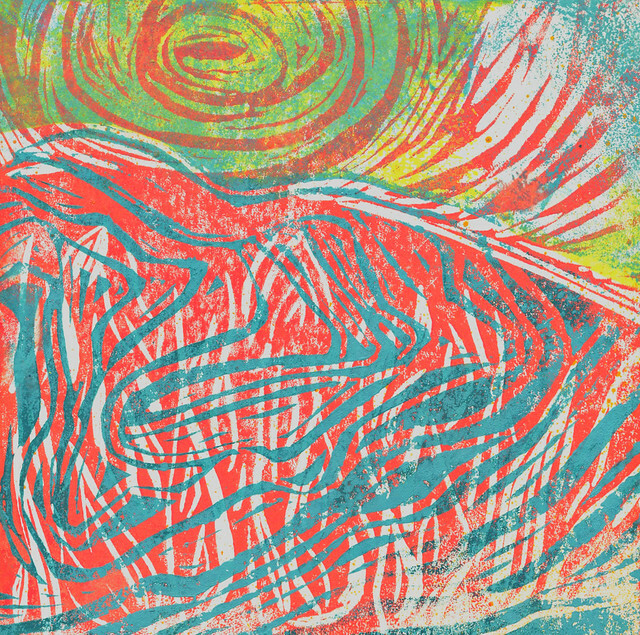 I've also been learning to make linocuts and I love that medium! 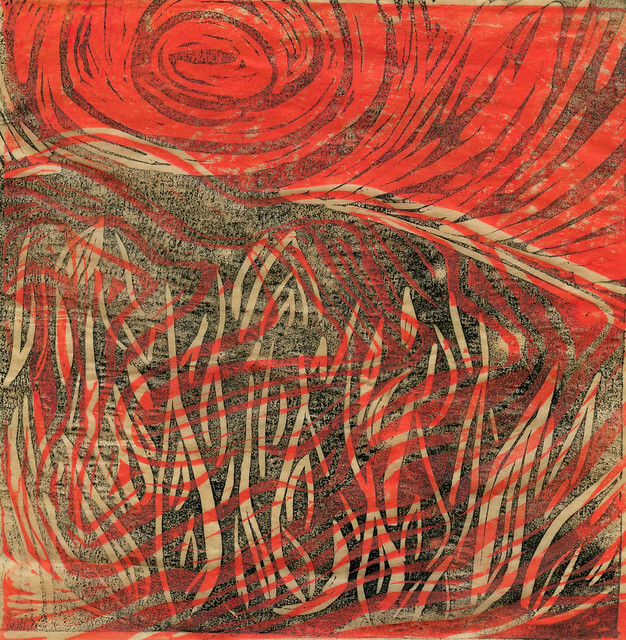 After a semester long ago spent learning etching and aquatint, and workshops in lithography, and silkscreen, I've finally found the printmaking method that calls to me. 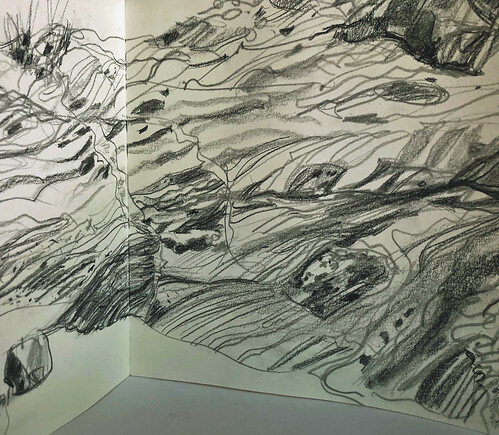 I feel it lends itself very well to my Caledonian Orogeny project, as a way of working back in the studio, after making my on-site drawings. Here's another. I beg your indulgence...I LOVE learning this art form and I love tweaking for color and texture changes! I will force myself to stop at posting two here. My garden will be on view this weekend to at least 1300 visitors, so I have had garden prep very much in my life these past months. 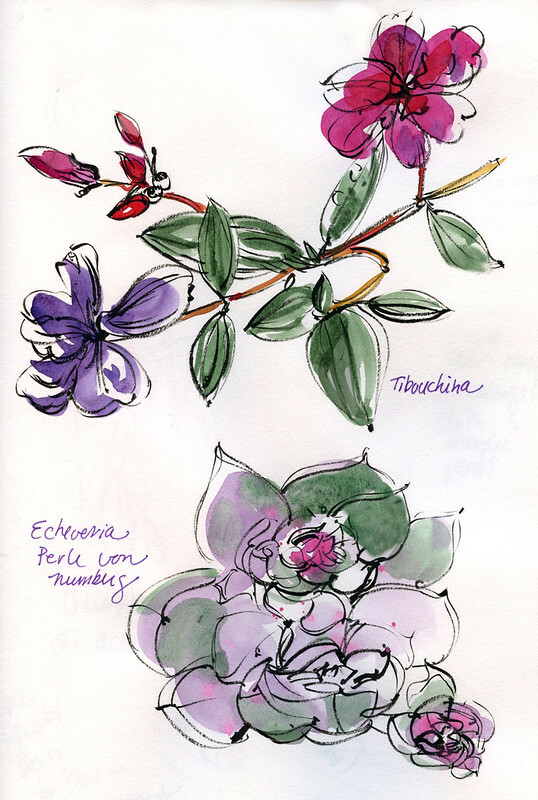 I am sharing, therefore, two garden images, one from my journal documenting two recent plant acquisitions and one sketch I made a couple of years ago at J C Raulston Arboretum, a sketch I recently rediscovered under a pile of other work. My trip to VERY northern Norway is coming up in May! To say I'm excited is an egregious understatement. I have lots more to tell before I go and I will! I've had a good beginning of the year so far, a combination of studio time (feeling my way with matte acrylic paint, which I love) and drawing and sketching, some examples of which follow! Here's a shift in mood! 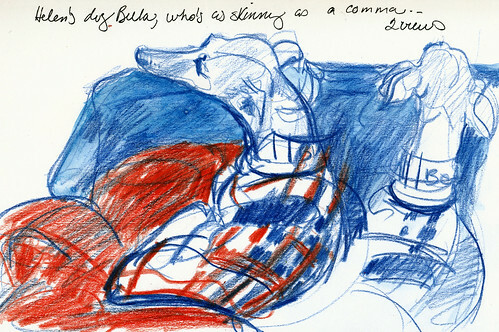 Just returned from a whirlwind trip to New York to see the David Hockney show at the Met, and made some sketches while there. 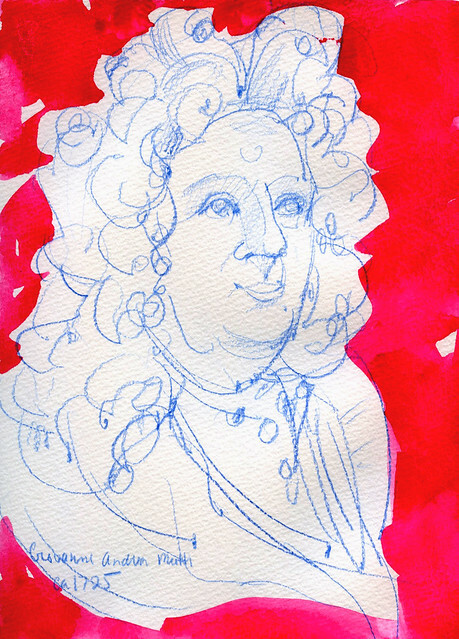 I was delighted by several marble portrait busts of men with cascades of curls (wigs, of course) and wish I'd had days to sketch more of them! 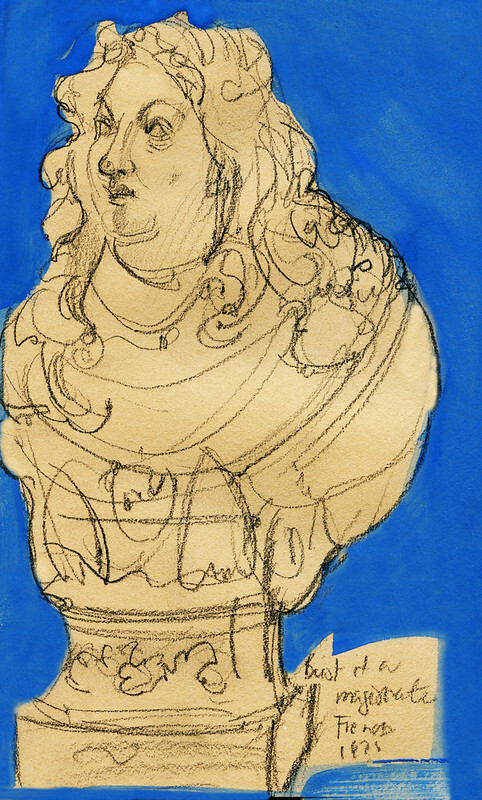 Drawn on site, red and blue gouache added later. 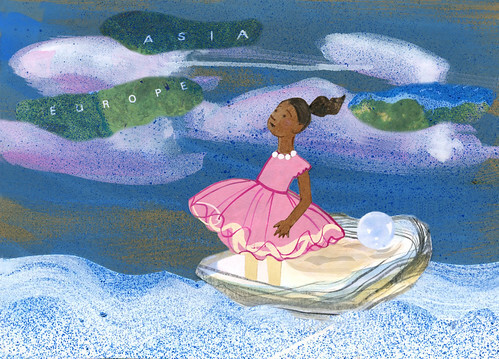 Finally, my illustration for the Winter 2018 issue of Charleston Style & Design Magazine, accompanying a lovely essay by Patrice Gopo, writing of her travel and fulfillment dreams for her young daughter. This will be my last CS & D illustration until summer when I look forward to getting back on board with that lovely magazine. For the next months travel and other work will be on my front burners. And the straight way was lost. Adapted from a translation of Dante's "Inferno," Canto I. Not exactly lost, and the chronology is off, but it's just that a new, indirect, and wavy way seems to be taking over here. I believe it comes from that life force, the c'hi, that I sense so palpably in my numinous places, and which inspires me in my art life. Well, I can't be in my numinous places (Norway, Wales, Iceland, Scotland, etc) every minute of the day, so I'm figuring out how to find charged experiences here, at home, in my daily life. And now, at the beginning of a new year, I've started following this barely-intuited way, this wavy, meandering way, in my journal/sketchbook. I feel a huge burden of guilt over unfinished paintings from the past year and more and this guilt has made it ever harder to return to that unfinished work. So, I'm going back, via this new way, to basics and to joy. I read the message in these lines and now I draw, paint, make marks, collecting my own images, from what I see around me, not just anything my eye happens upon, but scenes and objects that seem charged with a special energy, for whatever reason... and record them in my journal, to find out who... and where... I am. Again. I'm not making huge pronouncements or plans for now, just going step by wavy step. And I'm developing an awareness for presence of the c'hi in, say, a plate of apples. My new challenge is to be open to charged places and objects and settings near to home. Then, when I get back to Norway this May, I'll be more than ready to receive it! Happy New Year! May we be filled with energy and joy. 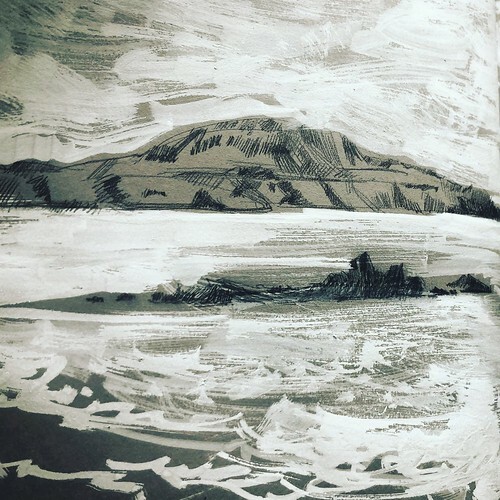 A late-breaking illustration job meant I had to press Pause on my painting series, but I've finished the illustrations and am turning my thoughts towards my upcoming trip to North Wales! I will share the illustrations I've done this summer once they are published this October. They are colorful and fun! 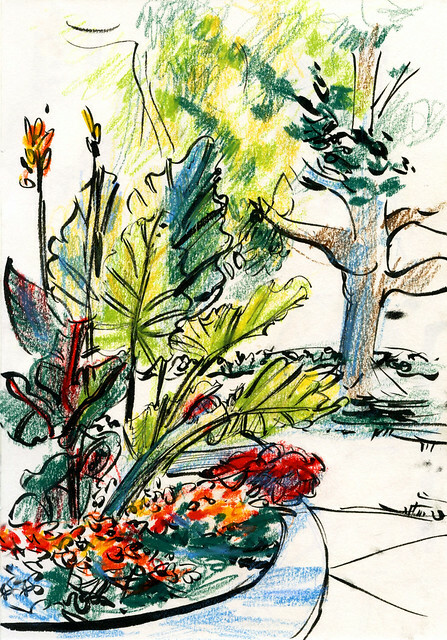 Before anything else, I want to tell you about a new book on sketching landscapes by my good friend and excellent American artist Virginia Hein. 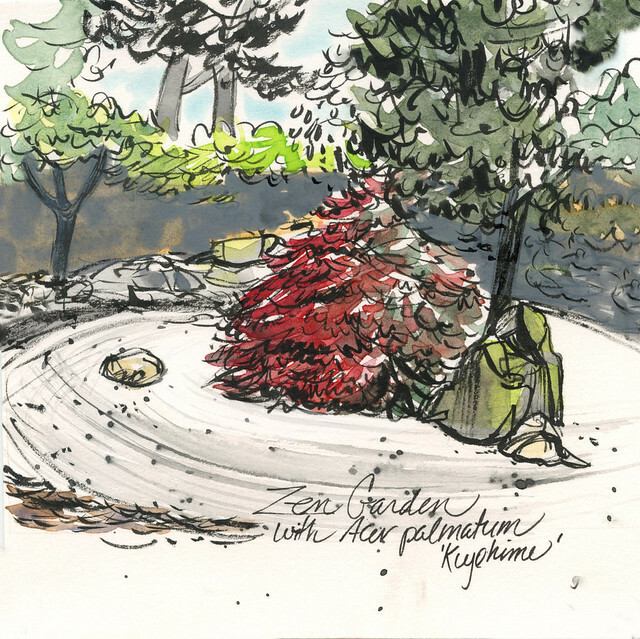 Her book 5-Minute Sketching: Landscapes is one of the best out there on the topic of sketching. And since there is a vast flotilla of books out there on that topic, that is saying a lot! 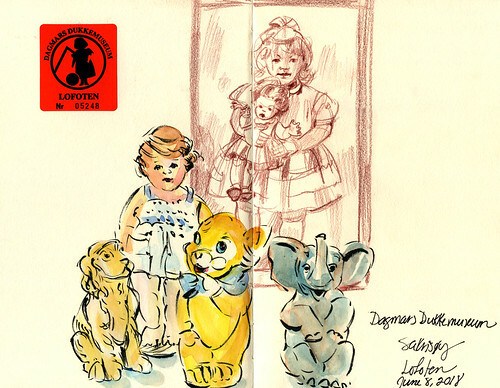 Virginia teaches at Otis College of Art and Design in Los Angeles, was for many years a toy designer, and is a prolific urban sketcher with a worldwide reputation and following. 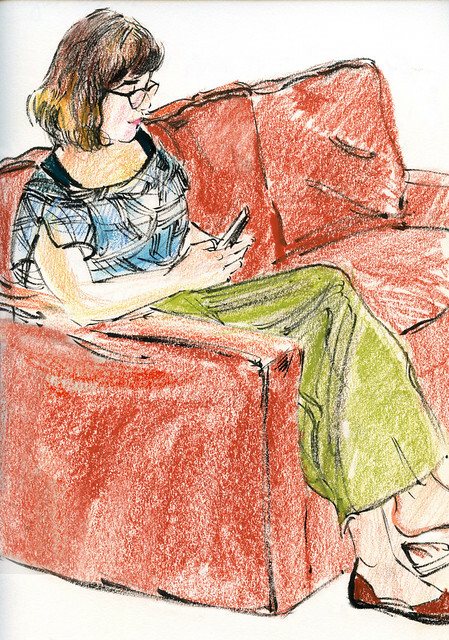 Her book is thoughtfully and gracefully written and is brimming with tips and suggestions and many, many illustrations of her own and of artists around the world. I am extremely proud to be one of her contributing artists. I sincerely recommend this book for anyone interested in rendering landscapes of all kinds. Virginia has a fresh, energetic, and inspiring way of thinking and teaching. No matter how many landscape drawing and sketching and painting books you might have in your personal library, you will love this one, I promise you! See those little tubes of Winsor Newton paint? 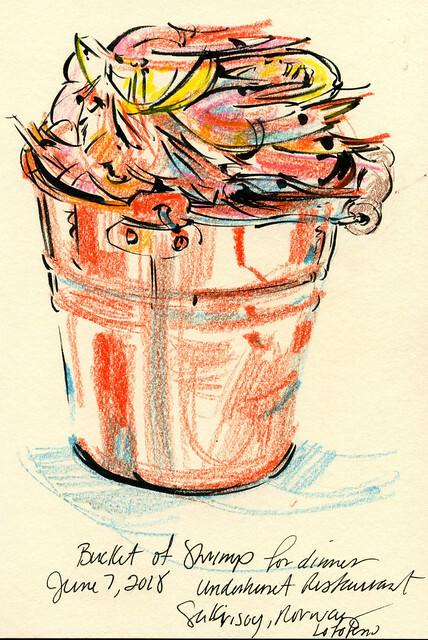 I have a hankering to try gouache. We'll see what happens. 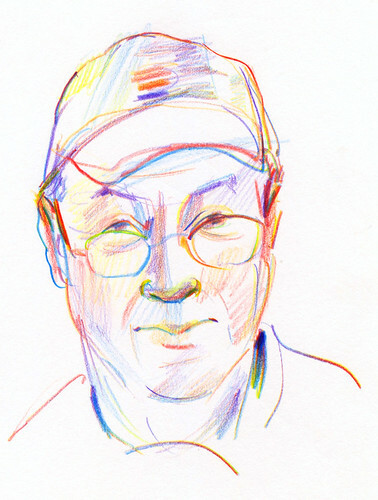 Finally, two quick and happy recent drawings, using my Koh-i-noor Magic Pencil with multi-colored lead. Hmm, I think I'd better pack that one for Wales, too! Help! 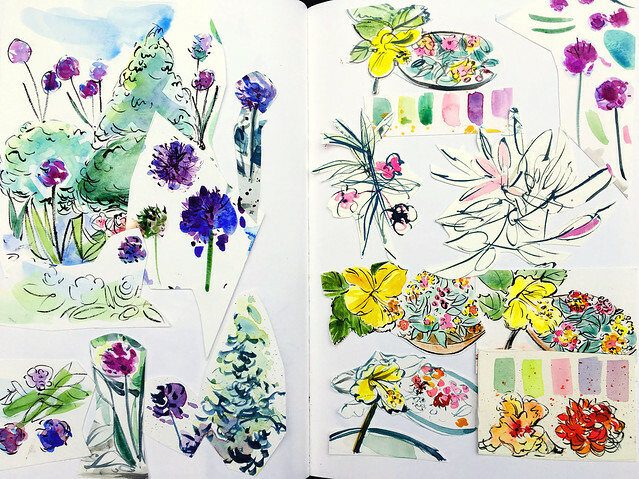 I'm working on illustrations to go along with the essay on my garden that I wrote for Charleston Style & Design's upcoming fall issue. Deadline: NOW or a time very much like it. What to do??!! Last night, I thought, "brush pen, why not?" I love working with my Pentel pocket brush pen. It feels almost like an extension of my drawing hand. I've used it for lots of sketch subjects and some illustrations over the years. I looked back at my Flickr account to remind myself of the ways I had done this and was waylaid by memories. May I share some of these rediscovered images and memories with you? 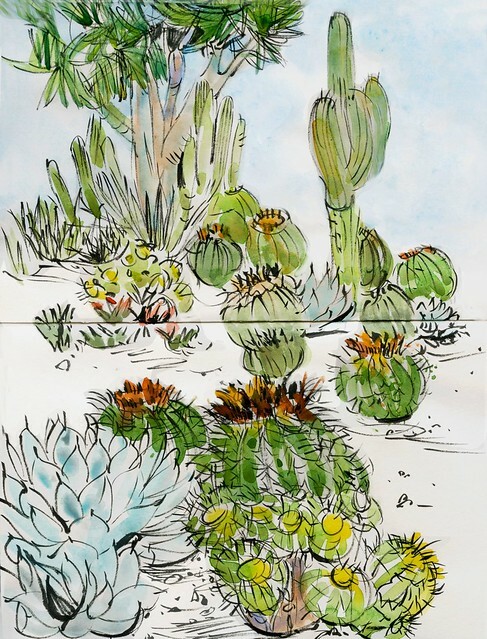 Below: In Pasadena,a cactus garden, part of the larger Huntington Gardens, that I visited with my friend and brilliant artist Virginia Hein on a sketching jaunt fall before last. This brings back such wonderful memories of our time together. I had hesitated to try brush pen with my current assignment because I wasn't sure I could get the nuances I want with it. 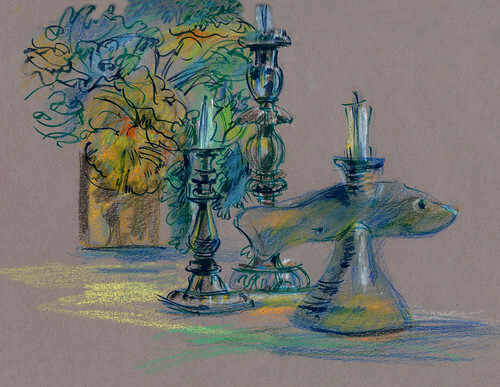 But this sketch managed nuance! 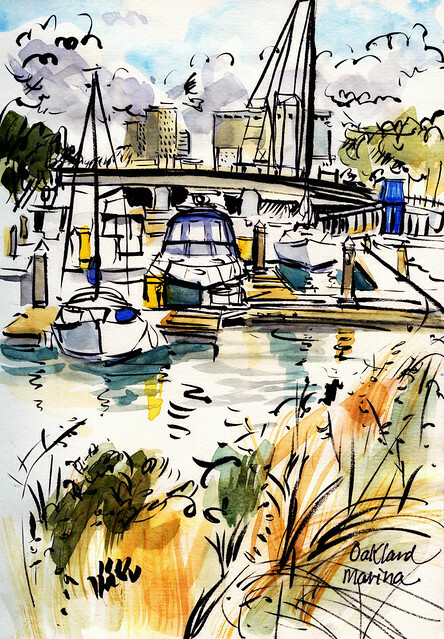 Next a scene from Oakland Bay from 2015. I was visiting my daughter Cecelia. Looking at this, I am instantly back in that day, in that place. And I miss my daughter so much. Some nuance here, too! 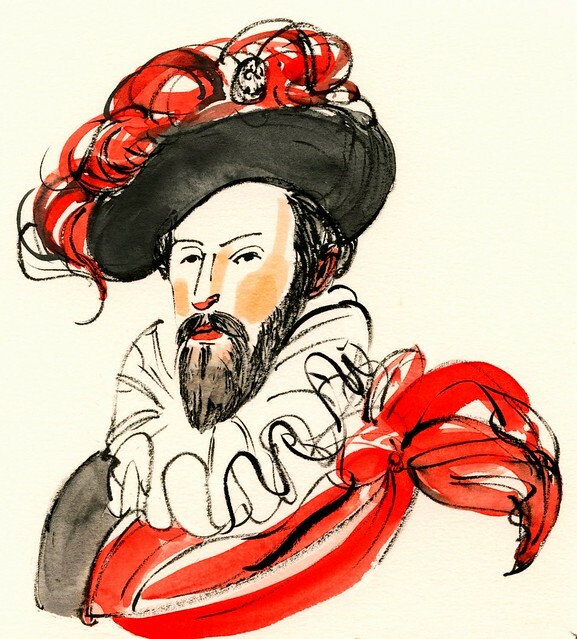 In another vein, a portrait sketch of Sir Walter Raleigh for the cover of Walter Magazine in 2013. I submitted several images. They chose another one for the cover, but I have always loved this Sir Walter's sassy and flourishy attitude. 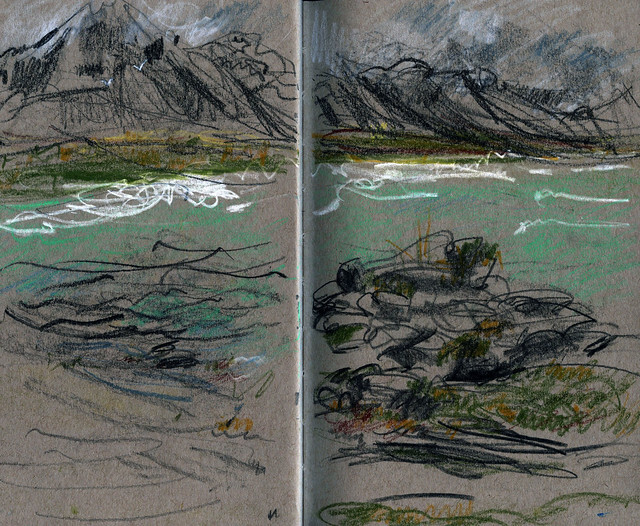 Jumping again to a quite different topic, here's a pretty atmospheric, nuancy sketch of a scene in Iceland. Drawing in the twilight, especially the Northern twilight.. aahhh. Heaven. 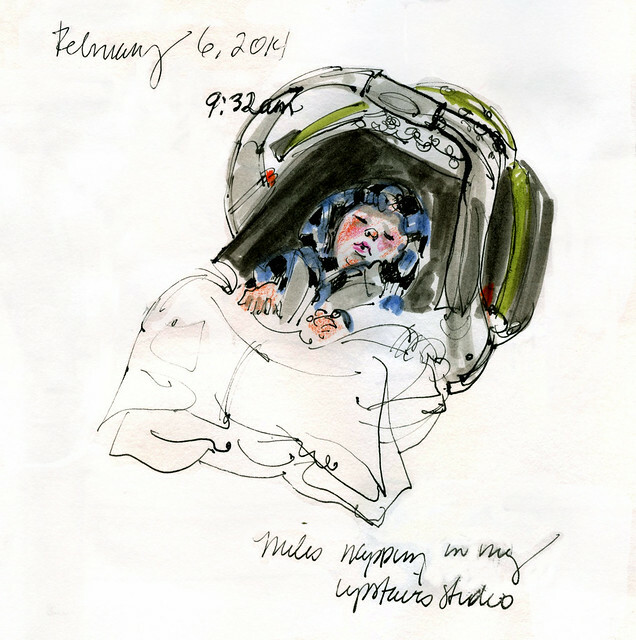 Finally, speaking of being overtaken by memories, I saw this pen and ink and crayon drawing of our Miles three or so years ago and, though it's not a brush pen drawing, it IS a drawing of a beloved baby, so that counts for a lot, doesn't it? Memories. Back to work now, keeping my fingers crossed that my brush pen and I will get this done!